When one balloon isn't enough to show how much you love someone, what do you do? You get many more balloons to send instead! 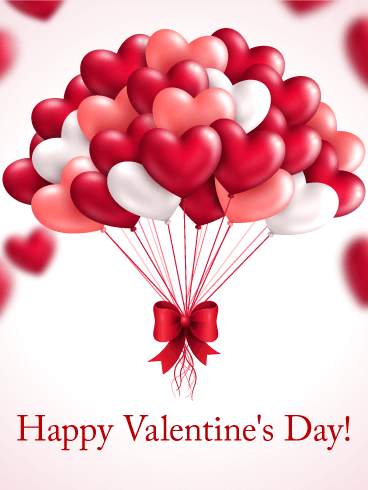 This Valentine's Day card features a bundle of red, white, and pink heart-shaped balloons, the perfect gift to send on this romantic holiday. 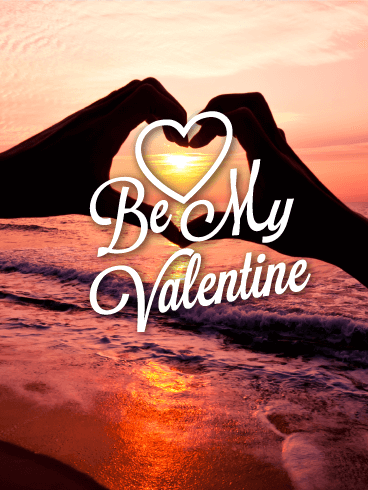 Use this sweet Valentine's day card to send a high-flying gift to your loved one today! 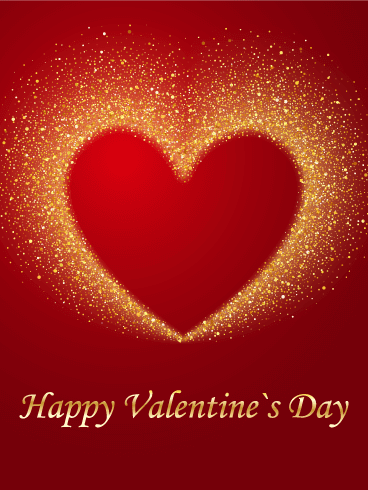 Hearts may be the popular Valentine's Day symbol, but you know that you love your sweetheart with everything in you - heart, soul, body, and mind. This Valentine's Day, tell your significant other just how important they are to you with a cute Valentine's day card! The large red heart on this Valentine's day card is the perfect way to celebrate your love this year! Make this Valentine's Day shimmer! This gorgeous Valentine's Day card is full of golden, glittery goodness that will make your love's heart burst. Don't let it be a secret that you admire her (or him! ); go for it and send this passionate Valentine's Day card today. 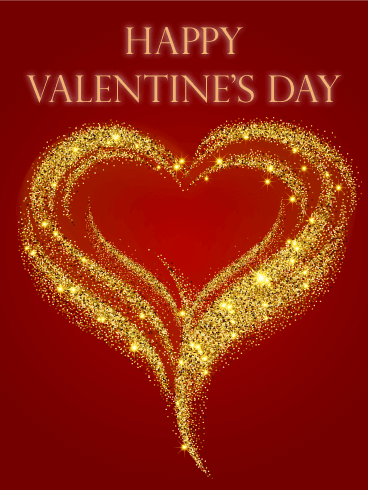 Celebrate love, speak to the heart, and deliver a Valentine that won't be soon forgotten. The prettiest pink Valentine's Day card you'll ever see. 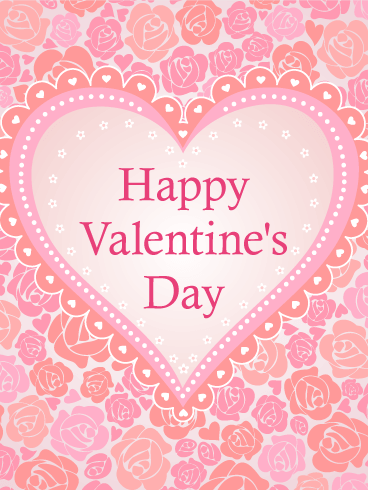 This precious Valentine's Day card is so simple and sweet, and has the perfect message to share. Hearts abound on this favorite love day, and this Valentine's Day card is no exception. Be a darling and send this affectionate greeting card today. Shower your sweetheart with sweet words and wishes. Wrap them up in hugs and cuddles. It's Valentine's Day for goodness sake! Go all out for love! Tell them from the bottom of your heart. Your love is deep and true. This Valentine's Day card is sentimental and intimate. The plaid heart is a quiet reminder of the depth of your love and the warmth that love brings to your relationship. Whether it's the hipster lumberjack in you that loves this Valentine's Day card, or the sentimental and romantic fool, you cannot go wrong. 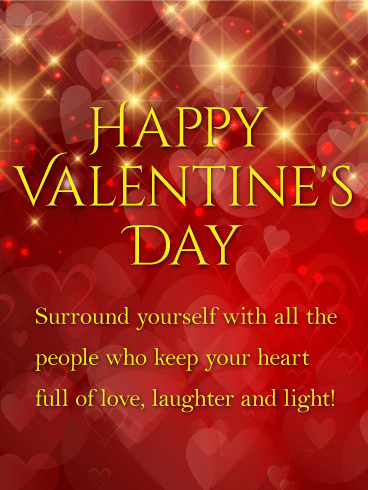 The sincere and loving Valentine's message is perfect for your sweetheart. Does your love burn bright and true? Celebrate your relationship with a bright, glittering card this Valentine's Day! The bright sparks and glitters that form the heart in the center will fill your loved one's screen with light and fill their heart with love. Use this holiday as an excuse to shower your sweetheart with love and cards to show your affection today! Oh, won't you be mine? Someone is just dying for you to ask them to be your special Valentine! 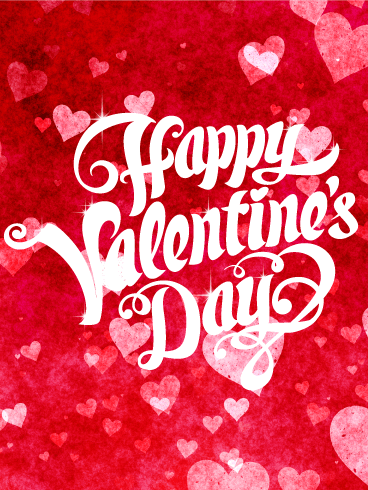 This cute Valentine's Day greeting is just the thing! A strand of darling, little, pink heart-lights make this Valentine's Day card glow. 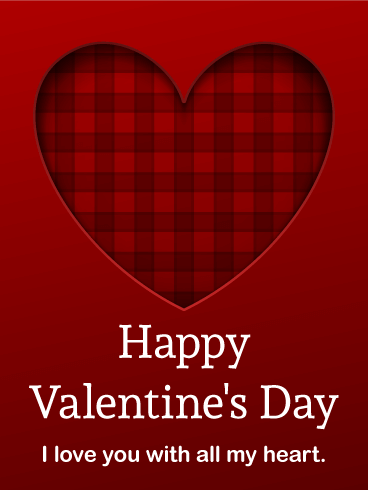 Do something sweet this Valentine's Day and send an affectionate card to someone special. This hot pink strand of neon heart lights is a unique take on a classic "Be mine" style Valentine's Day card. 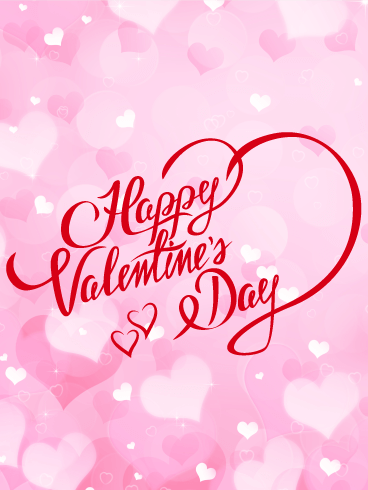 Valentine's Day is the perfect day to pamper your loved one with showers of gifts, sweet words, and Valentine's Day cards. Start this love-centric holiday the right way by sending this mosaic of hearts, stars, and roses to the special person in your life. 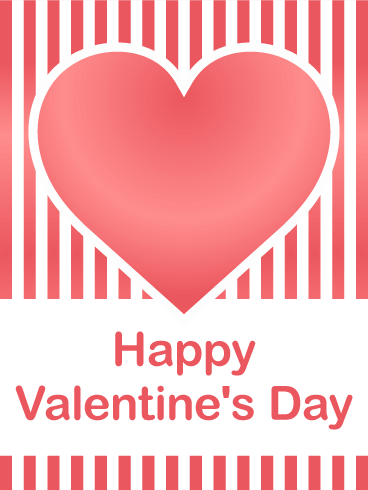 Use these soft pinks, oranges, and reds to send your affections to your love today! Long walks on the beach during sunrise or sunset are the most romantic experiences you can share with your love. If you don't live near the beach, don't worry! The beautiful image on this Valentine’s Day card will give your sweetheart the opportunity to enjoy this experience with you. No one deserves a romantic celebration more, so send this Valentine's Day card today! I'm sweet on you! Go in for the kiss with this sweet Valentine's Day card. Send it to someone you admire and adore. This card features a precious couple full of young love and hope. They are washed in the warm rays of the sun, just like love warms us from the inside out. 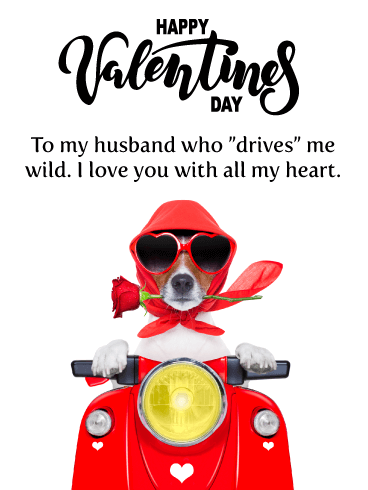 Let your love shine this Valentine's Day and send a hip and adorable Valentine's Day card to your special someone. Tissue paper hearts are sweet and lovely. This pretty Valentine's Day card is bursting with thoughtfulness and love. 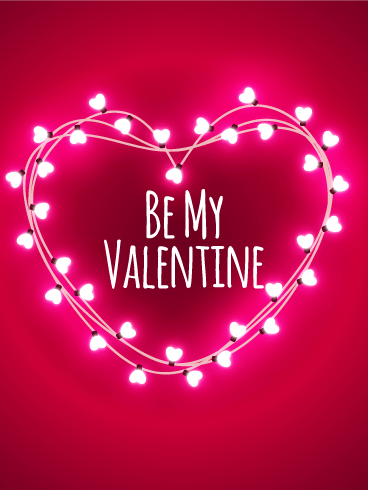 Send a special Valentine's Day card for a fun way to celebrate this holiday. Love is in the air, and hearts are everywhere! It's the sweetest day, so don't forget to be extra lovey-dovey with your affections. Dole out hugs and kisses by the dozens! Recite poetry and give roses. Today, is the day to celebrate love! Don't miss out!